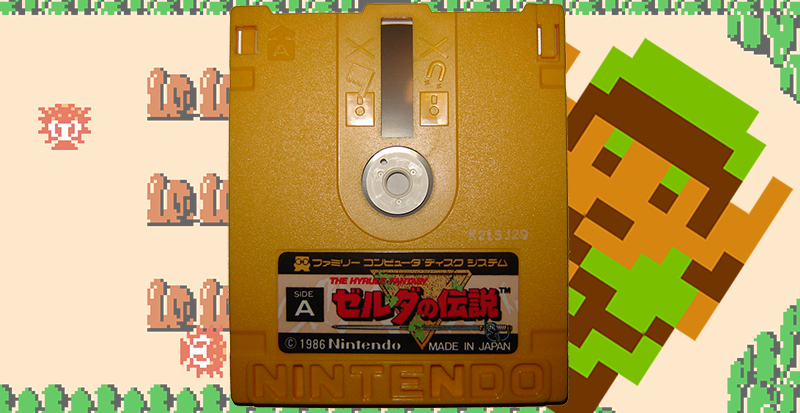 On February 21, 1986, Japan got its first taste of the magical land of Hyrule, though not on the famous gold cartridge Western gamers are familiar with. In early 1986, while gamers in the U.S. were getting acquainted with the Western version of Nintendo’s Family Computer (Famicom), the Japanese original got an upgrade in the form of the Famicom Disk System. The peripheral, though calling it that when it dwarfs the original Famicom feels off, gave the popular gaming system the ability to play games from proprietary floppy disks, known as Disk Cards. The floppy disks represented a less expensive means of data storage that cartridges, plus they had the ability to be written to as well as read, so games could be saved on disk instead of cartridge memory or via the complicated password systems popular at the time. Gamers in Japan could even take their disks to special kiosks and have new games written to them for cheaper than the cost of an outright purchase. Plus that large Nintendo logo raised and stamped at the bottom made excellent primitive DRM. The game itself is a bit different from the cartridge released in North America and Europe in 1987 as well. Loading times were slower but slowdown occured much less frequently, and the sounds were sharper due to the Disk System’s built-in wavetable synthesizer. Another famous difference between the two releases is the way the rabbit-like Pols Voice creatures are dispatched. The original Japanese release ultilized the Famicom’s built-in microphone to allow players to kill Pols with loud noises. The NES had no such feature, so in the West the Pols were made weak to arrows, though references to them hating sound were left in the game manual. For the most part however, the Famicom Disk System’s launch title was the same Shigeru Miyamoto and Takashi Tezuka fantasy epic we all know and love, just on a piece of boring yellow plastic instead of this majestic beast. Japan wouldn’t see a cartridge release of The Legend of Zelda until February of 1994, shortly after Nintendo Japan introduced a new, sleeker version of the Famicom sporting non-hardwired controllers lacking a microphone. The cartridge was green and hideous. So while Japan saw the first release of The Legend of Zelda 30 years ago today, the Western world got the shiniest. Today we celebrate 30 years of Hyrule in the fashion of our choosing. Reminiscence in the comments section, go play the original any way you can or quietly do the celebration dance of your people while no one is watching.